Dusty Baker calls a few innings with long time friend and Cal Bears broadcaster Jim Darby, while watching his son Darren play baseball for the team. Darren, a freshman, is the starting second baseman for the UC Berkeley baseball team and now that Dusty has been released from his job as manager of the Washington Nationals, he is back home in an advisory position with the San Francisco Giants and able to spend time with family and friends, watching his son play ball. BERKELEY, California — Let me see if you know this group, Dusty Baker says. He starts swiping left and right through his phone, searching for a particular video with a big smile. “Walk it, like I talk it,” he says under his breath, and not a second later he produces several videos from the Migos concert he attended on a whim. After spending the day at a conference a while back, he decided to chill with the Migos, practically at the stage. In every sense of the phrase, Baker has been living his best life since the Washington Nationals decided to not re-sign him as manager in October 2017 after the team bowed out of the National League Division Series for the second season in a row. A trip to the nation’s capital to speak to members of the federal government about race and also to Atlanta as a panelist for the Green Sports Alliance looms for Baker. Pit stops in Richmond, Virginia; Augusta, Georgia; and Greenville, South Carolina, also line his schedule, and if Baker has it his way, he’ll visit Vancouver, British Columbia, and hang out with the Cheyenne in Montana. The 68-year-old made the Native American tribe’s acquaintance the last time he was out of the game and left the group with the name “Brave Eagle” after he spotted the bird of prey on the ground. Baker invited the Cheyenne to come watch the Nationals in person, so members of the tribe made the trip from Montana to Denver when the Colorado Rockies and Nationals squared off. “He’s a real guy,” said Baker’s friend Seneca Pettus. “He’s gonna tell it like it is. He’s not no funny style person. He’s just a regular person. 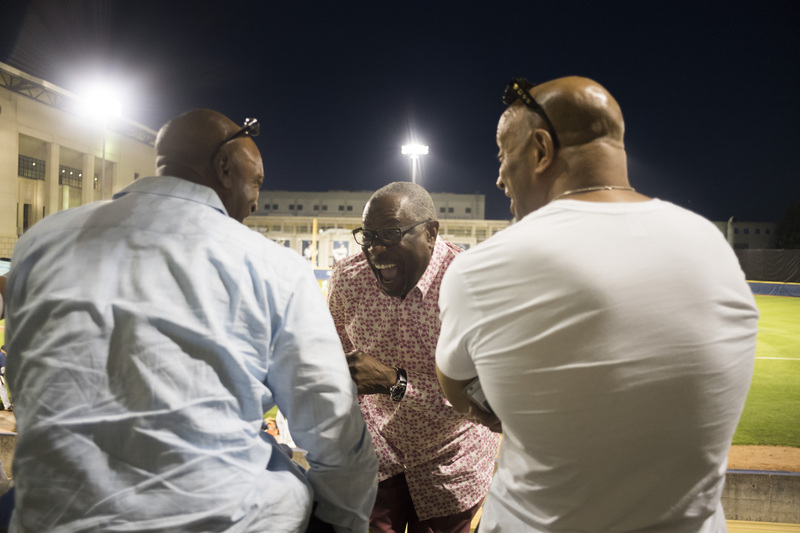 Dusty Baker (center) went to see his son, Darren, play baseball for the Cal Bears with a group of family friends. The alternative energy and wine businesses that suffered during Baker’s two years with the Nationals are on the rebound since his return home six months ago. And after a 16-year separation, Baker reunited with the San Francisco Giants on March 26 as a special adviser to CEO Larry Baer. He also will report to executive vice president Brian Sabean. A decision that initially left Baker with sleepless nights and hurt because his chance to win a World Series and earn 2,000 victories as a manager was taken from him is looking like it will pan out just fine. The traveling, speaking engagements and rehabilitating his businesses are all well and good, but the most important outcome has been the time spent with his family. As Baker reflects on what being let go by Washington has allowed him to do, he’s thoroughly convinced this season is all part of God’s plan. Baker didn’t know whether to pack everything, leave stuff in Washington, D.C., or split up his possessions between his home in California and apartment in the district. So for six days he waited for an answer. Each of those days included a trip to Nationals Park, where time seemed to stand still as the team took its time getting back to him regarding his future with the organization. 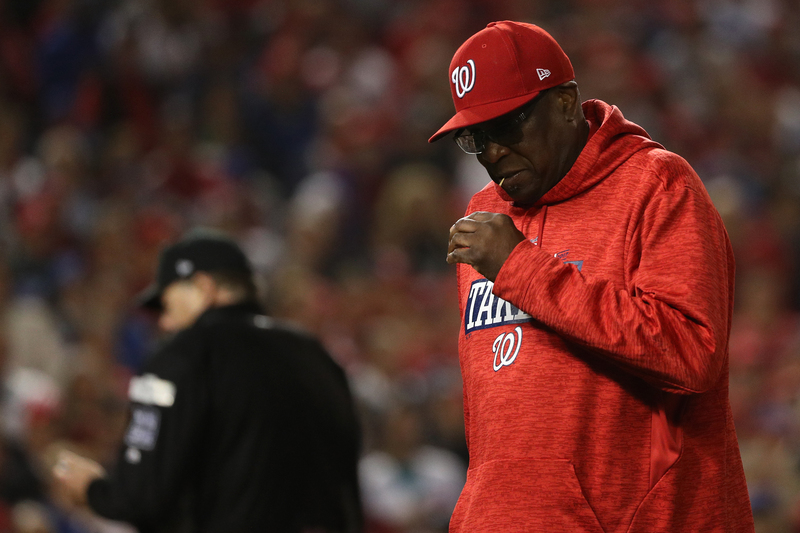 Dusty Baker of the Washington Nationals looks on against the Chicago Cubs during the fifth inning in Game 5 of the National League Division Series at Nationals Park on Oct. 12, 2017, in Washington, D.C.
Baker called a friend to come over and help him pack. Each day he’d pack a little more stuff. Soon it became apparent that he needed to pack everything. On his walls were photos from over the years, and those were the last things he put away. His friend shipped them so Baker could hang them in his San Francisco condo. Finally, he decided he needed to go home, so on the sixth day, a Thursday, Baker caught a 6 p.m. flight and was back in Granite Bay, California, by 9:30 p.m. The next morning, on Oct. 20, Rizzo called him saying he had bad news: The Nationals decided to go in a different direction. Just 15 days earlier, MASN’s Mark Zuckerman reported that Rizzo and Baker talked every day and were “both confident that he’ll be back with us.” That was the feeling at the start of October, even though no contract talks took place before the end of the season. “I didn’t ask why or nothing,” said Baker, who led the Nationals to 192 wins and back-to-back National League East titles for the first time in team history. “That’s the only explanation I have is they were going in another direction. So I didn’t ask why; it was too late. I said, ‘Thank you, Mike.’ I’ve talked to some of the people that worked there, but I haven’t talked to any other decision-makers, and I got a letter from [Nationals principal owner] Ted Lerner, which said thank you. … I didn’t know if it was Mike’s decision or not. That’s why I didn’t really sign the lease. If I thought and believed that, I would’ve signed the lease. The Nationals provided a statement via email in response to The Undefeated’s request for comment, the same one they issued when Baker was not re-signed. Over 19 seasons, Baker played for the Atlanta Braves, Los Angeles Dodgers, Giants and Oakland Athletics, got two All-Star nods (1981 and 1982) and won a World Series in 1981 with the Dodgers. In 1988, the Giants gave Baker his first coaching job when they made him their first-base coach and then hitting coach before he took over as manager in 1993. If Washington is Baker’s last stop as manager, he finishes with a career record of 1,863-1,636 with the Giants, Chicago Cubs, Cincinnati Reds and Nationals, nine postseason appearances and three National League Manager of the Year awards (1993, 1997 and 2000). His win total ranks 14th all-time among managers, and only one of the men ahead of him, Gene Much, has not been inducted into the Baseball Hall of Fame in Cooperstown, New York. Baker, one of two black managers in baseball last season, was the first African-American manager to inherit a winning team — the Nationals finished 83-79 in 2015 — in MLB’s history. He is also the only manager to lead three different teams to 90-plus wins and not return the next season. Including the postseason, Baker led the 2002 Giants to a 105-73 record and a World Series appearance before he left the team; the Reds fired Baker after a National League wild-card berth and 90-73 record; and the Nationals didn’t retain him after finishing 99-68 and losing their second consecutive NL Division Series. For a few days, Baker just stayed around the house. Even the thought of his favorite pastimes, fishing and hunting, couldn’t help him cope with his managing career ending the way it did. Melissa, Baker’s wife, said that’s how one knows that he’s in a really bad place. It’s just like death, Baker explained. One mourns for a while, but life goes on. So Baker decided to go on and live his life. “She knows if I’m not in the mood to go hunting, something’s hurting,” Baker said. “But I’m a big boy, so I got back into my business, back into my son. … I wasn’t sleeping for a while. I would wake up in the middle of the night pissed off. Nobody should affect your life like that. I just came to the final conclusion after a couple of weeks, and then it slowly subsided. “It’s helped a lot seeing my homies. We don’t talk about it much. … When I come home, it’s all good, man. No matter what happens, it’s good. A lot of [my boys] got me out the house. 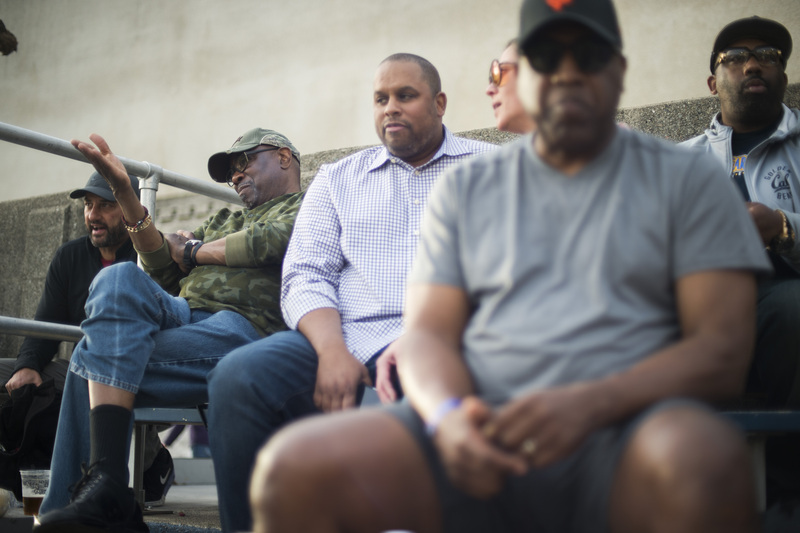 Dusty Baker (second from left) with Orlando Cepeda Jr. (third from left) and other family friends, watches his son, Darren, play baseball for the Cal Bears. Don’t be surprised if the Giants call you, Chris Berman, the former ESPN analyst and rabid Giants fan, told Baker several months ago. Baker pretty much discounted it until he received a call from Sabean a few weeks ago to gauge his interest in rejoining the team. Baker informed Sabean that he was busy with his Baker Family Wines company and Baker Energy Team business, which just teamed up with the music group Kool & The Gang to take power to Africa. Robert “Kool” Bell has done a number of concerts across the continent and reached out to Baker after Bell’s cousin, Ken Griffey Sr., told him about Baker’s solar company. Baker had winning records in seven out of the 10 seasons he managed the Giants. In his first season, San Francisco improved its win total by 31 games, finishing with a 103-59 record, and Baker was named the 1993 NL Manager of the Year. He was honored with the award two more times, in 1997 and 2000, when the Giants won division titles both of those seasons. In Baker’s final season, San Francisco went to the 2002 World Series and dropped the seven-game series to the Anaheim Angels. On April 3, the Giants’ home opener, Baker was one of the 10-plus alumni honored during the team’s 60th anniversary celebration. Darren Baker hit until his hands bled. He came home in mid-March and asked Baker if they could hit in the cage, so the pair did a lot of tee work, soft toss and bunting each way. Darren, a second baseman at the University of California, Berkeley, hit about 200 times. His game is hitting, running and playing good defense. More than anything else, Darren wants to be a good teammate. He doesn’t like to be separated from his teammates, and he’s not interested in special privileges — even if he’s given permission to leave early, he’ll tell Baker that he can’t do that. When the game is going on, Baker makes sure no one talks to Darren B — that’s what all of Dusty’s friends call him. And even though Baker is mindful not to talk to his son too much after games, he often whispers any advice he might consider giving his son to himself throughout games. The younger Baker went through a hitting slump, and even then Baker was reluctant to over-coach. He watched his son get frustrated by his lack of offensive production and start to get away from the things that he does well. 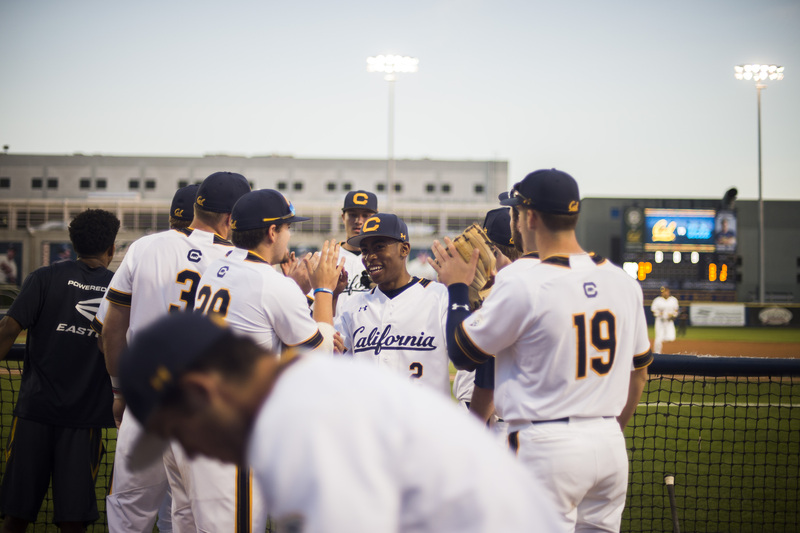 Darren Baker (center) comes in from the field and is congratulated by his Cal Bears teammates after making a difficult defensive stop at second base. “It’s more nerve-wracking than playing or managing a team,” Baker said. “I want him to do well, especially because Darren is committed to doing well, and all he’s wanted to do since he was a kid was play ball. Baker is quick to remind folks that his son is only a freshman. Because Darren has sat on big-league benches, Baker is willing to concede his son’s baseball IQ is extremely high after watching numerous great players and coaches upfront, behind the scenes and when they’re executing as the game is being played. Ever since his son was born, Baker has had him at major league ballparks, so now that he’s a starter for Cal, he’s easily at home on the diamond. The 19-year-old has also been invited to play in Massachusetts’ Cape Cod Baseball League, so Baker is looking forward to traveling to those cities. Cal began pursuing Darren after his sophomore year at Jesuit High School in Carmichael, California, and while he looked into other schools, he decided early that Cal was the place he wanted to be. The commitment proved to be a good bet for Darren. There was an improvement in his GPA, which went up a point and a half, because he didn’t want to be embarrassed to not be able to get into Cal. Pepperdine, Loyola-Marymount, Santa Barbara, USC and UCLA were a few of the other schools he considered, but he told his father he wouldn’t study at Santa Barbara or Pepperdine because they were on the beach. Darren said the main reason for committing to the Golden Bears came down to his relationship with coach Mike Neu and assistant coach Noah Jackson, who have watched him mature as a baseball player since ninth grade. During Baker’s final two seasons in the majors as a player, he met 4-year-old Noah Jackson, who served as the Oakland Athletics’ bat boy. Noah’s father, Sylvester Jackson, was the pregame radio and TV show host who changed the media-player relationship in the Bay Area by allowing A’s legend Rickey Henderson to cut his hair. Shortly before Jackson died of cancer in 1992, he asked Baker to become Noah’s godfather, so Noah has been in Darren’s life since he was born. 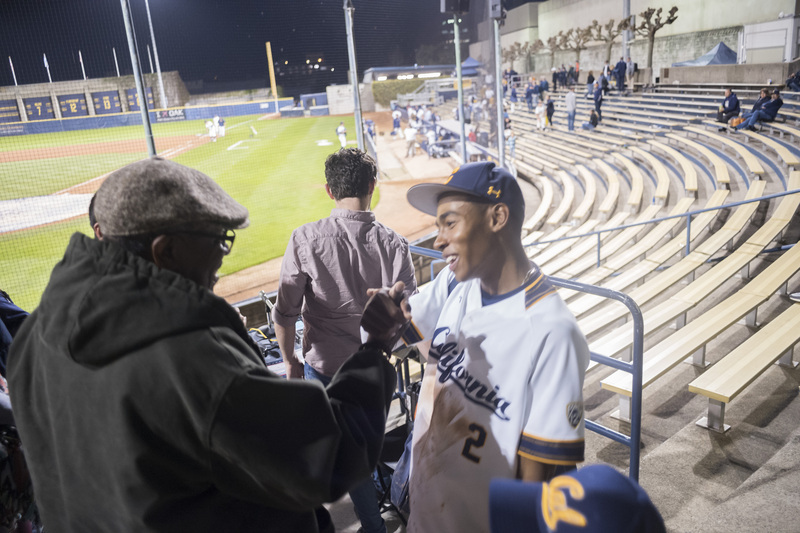 Dusty Baker (left) greets his son, Darren, as he comes off the field after playing second base for the Cal Bears against UCLA. You want stats for the players? Oh, Baker can tell you those off the top of his head. His investment in Cal does not stop at his son; he’s taken a vested interest in each of the players on the team and is a crowd favorite at games. Spend one game sitting with Baker in the back row of the stands parallel to the first-base line and one can a learn a little bit of everything about each player on the team. No. 10, Tanner Dodson, went to Darren’s high school and is a great hitter, pitcher and outfielder, making him an intriguing prospect for the major league scouts. No. 20, Andrew Vaughn, can absolutely blast the ball — and he did so several times in the first two games of Cal’s series against UCLA on March 29-30. No. 14, Jonah Davis, is an outstanding outfielder and has taken Darren under his wing. No. 21, Jared Horn, is Baker’s favorite though. Horn is a fantastic pitcher and even better person, Baker explains, who around Thanksgiving last year lost his father, little brother, uncle and cousin after a drunken driver hit their car and caused it to flip. Similar to the way Horn was surrounded by love and support after his family’s tragedy, Baker doesn’t question whether people would support his son in the same manner. C’mon, man, was the look Babitt shot Baker. Home run king Barry Bonds, who was hired as a special adviser to the CEO a year and six days before the Giants asked Dusty to come on, has told Baker he wants to attend one of Darren’s games. Oakland A’s legend and two-time World Series champion Bill North has said he’s coming to a game, as has Hall of Famer Joe Morgan, who serves as a special adviser to baseball operations for the Cincinnati Reds. Have we seen the last of Baker as an MLB manager? More than likely, unless a contender comes along and reaches out for his services. Otherwise, he’s exactly where he wants to be. “Why miss something I can’t do anything about?” Baker said. “At that point it’s just torture. So I’ve moved on to passing the knowledge I have on to somebody else.